Until 1915, there was a lively mineral spa scene happening at Clifton Springs - gorgeous bathhouses, a mineral water bottling plant, ferry loads of tourists coming down from Melbourne to 'take the waters'. And any wonder, with 5 natural springs bubbling up from underneath the ground right through the sand on the protected and picturesque beach. Today, you can no longer reach Clifton Springs by ferry, though it is little over an hour's easy drive from Melbourne, just past Geelong and before you reach Drysdale and Portarlington on the Bellarine Peninsula. 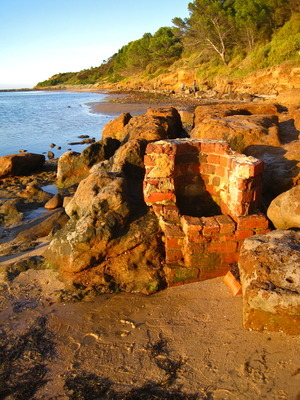 Sadly, the bath houses and bottling plants are also long gone, but you can still walk along the beach and hear and see the rather amazing sight of fresh water bubbling up through the sand and shallow waters beside the beach. The hand made brick remnants of some of the old wells still remain, as do shatterings of the thick glass bottles, with rounded bottoms, which were imported all the way from Belfast and other places to bottle the precious waters. 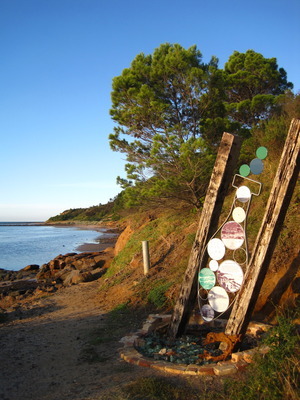 The old springs site is accessible along a walking track which follows beside the beach to the right of The Dell, a secluded picnic ground which is reached by means of a long, steep staircase at the end of Springs Street (Melways reference 456 H5) . This is an excellent adventure for families with kids, who will love hunting for the bubbles, especially on a hot day, when the shallow and safe waters of Clifton Springs will bring welcome respite. You could also round out the day by hiring a boat from Mike at the Clifton Springs Boat Harbour Boat Hire, for a spot of fishing or sightseeing, or just kick back with a picnic lunch at The Dell.